Calorie restriction is a well-known method of weight loss that has been used for many years. However, many people struggle to adhere to this strategy and few people are successful in maintaining their weight loss. This has led to new and effective dietary strategies that can enable a person to lose weight and, most importantly, maintain their lower, healthier body weight. In recent years, intermittent fasting has become a hot topic in the world of biomedical research, with an ever-increasing number of scientific publications on the topic. Scientists weren’t always intrigued by the research and it wasn’t until the last several years that the mounting evidence on intermittent fasting as a practice begun to gain momentum and acceptance for weight loss. What’s the difference between calorie restriction and intermittent fasting? Calorie restriction and intermittent fasting may seem similar, but there are important practical, and scientifically relevant, distinctions between the two. Calorie restriction is a daily reduction in calories (energy) of about 500-600 fewer calories than you usually consume each day. In contrast, intermittent fasting is a pattern of eating that involves going without food for several hours or up to a couple of days and it can become a lifelong habit. Although calorie restriction is still an effective way for a person to lose weight, few people are successful in maintaining their weight loss (1, 2). Research suggests that intermittent fasting is as effective for weight loss as calorie restriction and offers a solution for those who don’t wish to restrict their calorie intake daily (3). Is there research to support intermittent fasting? In one study, overweight women who fasted intermittently for six months lost more weight than women who restricted their calories each day. Approximately 34% of the women undertaking the intermittent fasting protocol lost 10% or more of their initial body weight in a six-month period, compared to 22% of women who restricted their daily calories. The intermittent fasting group also saw a greater decline in waist circumference, which is an indicator of the amount of visceral fat lost (2). Although it seems counter-intuitive, evidence suggests that a consequence of regular intermittent fasting may be that less food is consumed during ‘normal’ calorie days (2). Scientists believe one of the reasons may be due to the stomach shrinking in size during intermittent fasting days. Can intermittent fasting and calorie restriction be used in combination? The combination of intermittent fasting and calorie restriction has recently been studied and was shown to be effective for weight loss (4). This combination may facilitate greater weight loss and can also help to reduce boredom that is typically associated with other diet plans. This has also been shown to be sustainable in the long-term for weight loss followed by weight management (5, 6). At Isagenix we pride ourselves on being ahead of the curve. We recognised the benefits and have been advocating our nutritionally supported fast since our inception in 2002. In addition to this, our form of intermittent fasting also offers a sustainable, simple option to lose weight. The reason ‘sustainability’ is important is because few people successfully lose weight and then maintain their weight loss (1). Isagenix Weight Loss Systems include an intermittent fasting and calorie restriction protocol that has been shown by scientific research to be effective in reducing body weight, fat mass and visceral fat in overweight and obese men and women in the USA (4, 7-8). The most important fact about Isagenix Cleanse Days* is that it works! 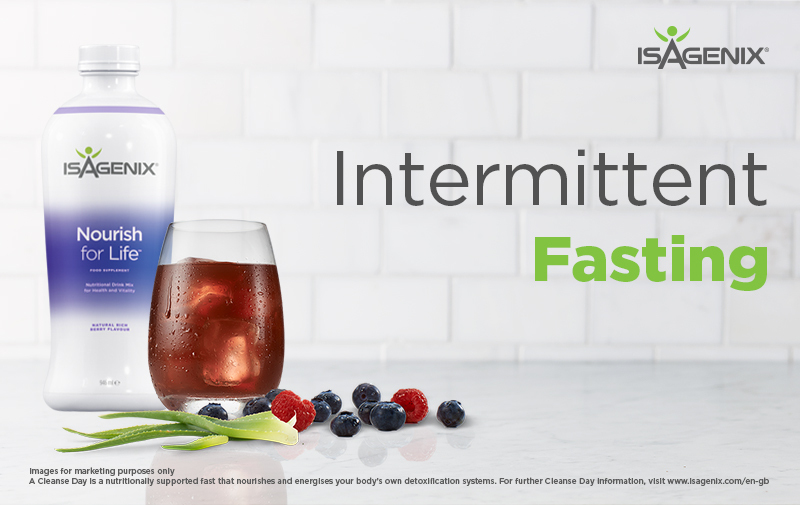 Cleanse Days* on the Isagenix system supports weight loss and health through intermittent fasting. Cleanse Days* limit calorie intake while the vitamins and minerals found in Nourish for LifeTM provide the body with nutritional support. The Isagenix System as a whole is one of convenience providing delicious, nutrient-packed, quality products and flexibility, so that you can make the system work for you in achieving your personal goals. *A Cleanse Day is a nutritionally supported fast that nourishes and energizes your body’s own detoxification systems. For further Cleanse Day information, visit Isagenix.com. Johnstone A. Fasting for weight loss: an effective strategy or latest dieting trend? Int J Obesity 2015:37;727-733. Harvie MN, Pegington M, Mattson MP, Frystyk J, Dillon B, Evans G, Cuzick J, Jebb SA, Martin B, Cutler RG et al. The effects of intermittent or continuous energy restriction on weight loss and metabolic disease risk markers: a randomised trial in young overweight women. Int J Obes(Lond) 2011;35:714-27. Eshghinia S, Mohammadzadeh F. The effects of modified alternate-day fasting diet on weight loss and CAD risk factors in overweight and obese women. J Diabetes Metab Disord2013;12:4. Klempel MC, Kroeger CM, Bhutani S, Trepanowski JF, Varady KA. Intermittent fasting combined with calorie restriction is effective for weight loss and cardio protection in obese women. Nutr Jour 2012:11-98. Arciero PJ, Edmonds R, He F, Ward E, Gumpricht E, Mohr A, Ormsbee MJ, Astrup A. Protein-Pacing Caloric-Restriction Enhances Body Composition Similarly in Obese Men and Women during Weight Loss and Sustains Efficacy during Long-Term Weight Maintenance. Nutrients 2016 8(8), 476. Li Z, He F, Tinsley GM, Pannell BK, Ward E, Arciero PJ. Comparison of High-Protein, Intermittent-Fasting Low-Calorie Diet and Heart Healthy Diet for Vascular Health of the Obese. Front Physiol 7:350. Varady KA, Bhutani S, Klempel MC, Kroeger CM, Trepanowski JF, Haus JM, Hoddy KK & Calvo Y. Alternate day fasting for weight loss in normal weight and overweight subjects: a randomized controlled trial. Nutr J. 2013 Nov 12; 12(1):146. Kroeger CM, Klempel MC, Bhutani S, Trepanowski JF, Tangney CC & Varady KA. Improvement in coronary heart disease risk factors during an intermittent fasting/calorie restriction regimen: Relationship to adipokine modulations. Nutr Metab (Lond). 2012 Oct 31;9(1):98.